WHAT TYPE OF GAMBLING SERVICES DOES WVADS, INC. OFFER? 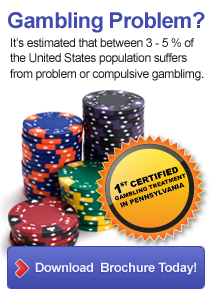 WVADS, Inc. became the first agency in the Commonwealth of Pennsylvania to be certified to treat individuals with gambling problems. Additionally, the staff of our agency was the first certified in problem gambling statewide. The agency provides counseling to patients and family members who are not only pathological (compulsive) gamblers, but also provides services to anyone who believes they are developing a problem with gambling. This may be action or escape gamblers, binge gamblers, professional/sports gamblers, or social gamblers. IF I NEED HELP, HOW DO I ACCESS YOUR TREATMENT PROGRAM? Quite simply, we are a phone call away. By calling 820-8888, we will schedule a prompt, confidential, appointment for you or your loved one to receive an assessment/evaluation. The results of this evaluation will help us to determine the most-appropriate type of treatment. HOW DO I PAY FOR GAMBLING TREATMENT AT WVADS, INC.? Third-party health insurance companies do not as yet pay for gambling treatment. We are hopeful that within a short period of time, reimbursement will be available for these services. WVADS Inc. currently has a contract through the Department of Drug and Alcohol Programs (DDAP) which provides reimbursement for gambling counseling services. In those specific cases where DDAP reimbursement is not applicable, we will work closely with the patient and family to arrange for a payment plan that will not place a further financial burden on the individual. The Luzerne-Wyoming Counties Drug and Alcohol Program is also a potential funding resource to help offset the cost of treatment. We will work with that agency to determine if assistance is available in the event that payment becomes difficult for the individual. DO YOUR GAMBLING TREATMENT SERVICES ADDRESS SPECIFIC DIFFERENCES IN PATIENTS? personal history of alcohol or drug abuse video game fixation (flashing lights, clanging bells, fast excitement). The Harvard Medical School Division of Addictions conservatively estimates that 7.9 million American adolescents are problem or compulsive gamblers. The strength of our treatment program at WVADS, Inc. is recognizing the individual needs of each patient we serve. HOW PREVALENT IS PROBLEM GAMBLING IN THE U.S.? When you sit back and analyze how many different forms of gambling we participate in, you can see why many people say we live in a gambling culture. ARE THERE QUESTIONS THAT ONE CAN ASK TO DETERMINE IF THEY HAVE A PROBLEM WITH GAMBLING? Additionally, should you decide to seek treatment at WVADS, Inc., we will administer the South Oaks Gambling Screen, which is considered one of the most effective, if not the most effective, gambling screening tool available. ARE THERE WEBSITES THAT YOU CAN RECOMMEND SO I CAN GET MORE INFORMATION ON GAMBLING? DOES WVADS, INC. PROVIDE SCHOOL AND COMMUNITY PREVENTION AND EDUCATION PROGRAMS? Yes. WVADS, Inc. is not only known for its outstanding treatment programs. The agency also has the same reputation for its prevention/ education services. We will be more than happy to tailor our presentation to meet the needs of your audience on any topic associated with gambling and other addictions. We invite you to call our agency today to schedule a program for your school, group, or organization. Remember…EDUCATION IS THE KEY TO PREVENTION.